To see the elevation profile or to export the GPS data (GPX and KML files), please click on the track. The starting point of this circular trail is the former train station Op der Gare at the end of the Route de Luxembourg in Consdorf. There, you will see the monument of a disarmed, mounted aircraft bomb from the Second World War which was found at the edge of the village. First, the trail leads over an asphalted road to the romantic little valley called Dielchen and then follows a small path, leading you past the former recluse Méchelskierch and then further onto open fields around the hamlet Wuelper. You will now soon reach the plateau of Muerbësch, a woodland parcel with a number of so-called Mardellen, round basins in the ground that are partly filled with water but can sometimes dry up in summer, but are essential to the survival of amphibians. Passing through more open fields you will see on the southern horizon the skyline of the hamlet Altrier with its distinctive water tower. 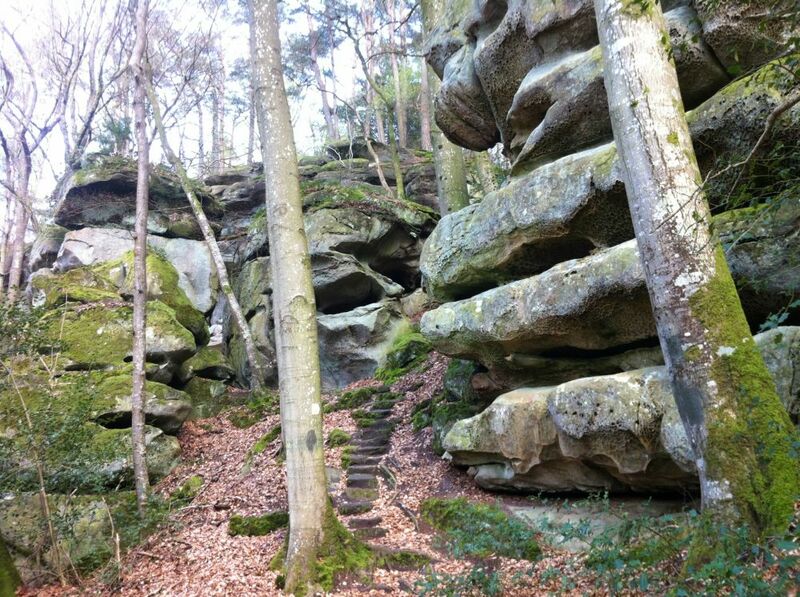 Next, the path leads you past the Steebaach and markings on the rocks dating back to the stone age down into the valley of the Härdbaach. After crossing the stream, there is a climb into the rugged rock face with many bizarre kinds of erosion. The absolute highlight of this trail is the crossing through the pitch-black rock crevice Kuelscheier. A visit to the entire area Adventure-Kuelscheier is recommended before following the ascending trail out of the valley back to the village and the starting point.